Create a winter wonderland with cool white and vivid blue icicle lights this Christmas and experience your most enjoyable lighting project yet! Commercial quality LED icicle lights are highly durable, energy efficient and easily installed allowing you to worry less and spend more time enjoying your holiday. Hang vivid icicle lights from the roof, along your fence or across porch railings for a whimsical wonderland full of light! I love the lights. They are beautiful! Thank you! Looks nice when rounding the corner down my street. Much better than the warm white ones you buy in the store. You need to get some, I don't think you will regret it. These lights are so bright and look great once up. Love them. Very nice product. They look great on the house. Very bright and easy to hang. I've been decorating with these for 6 years. I dim them approx. 50% for a truly unique effect - peaceful, "Silent Night" effect. I accomplish this by using an electronic dimmer (X10 or Insteon) and by including a couple of standard incandescent light sculptures on the same strand as the LED icicle lights. The incandescent bulbs provide a load to the circuit allowing for complete range of dimming and for 100% off. Without the incandescent load, the LED lights won't turn off completely. Again, the dimmed effect is breathtaking. Only downside I have to report is that the strands don't last forever. I originally bought 16 strands to cover the entire from of the house. After 5 years, some strands - maybe 30% - have failed. That's why I'm back here today to order a few replacements. It's not the bulbs that fail but the electronics (rectifier?). Worth it? Yeah. Neighbors love 'em & so do I.
I added these strands to my current strand display. They are much brighter and adds additional beauty to my holiday display!! It's beautiful. When I hung the lights my wife came home from work, and she jumped and screamed it's so lovely. 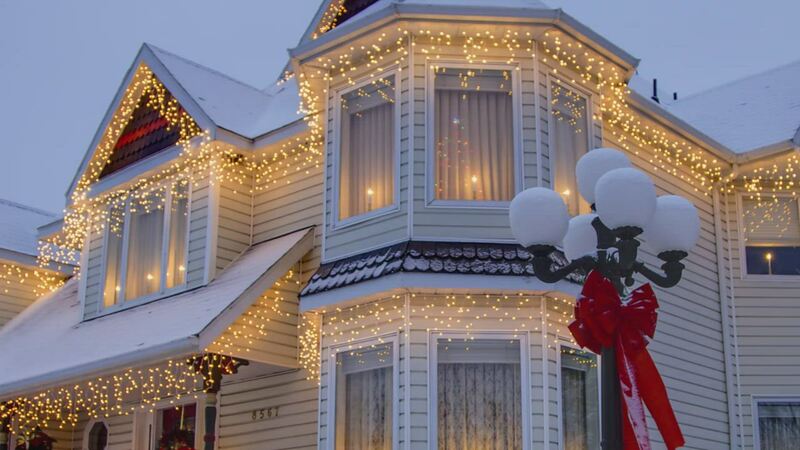 These lights can certainly bring good cheer to your holiday! I purchased the blue/white bulbs to replace an existing incandescent set I've had for over eight years. These new light are more efficient and produce a calming glow over our whole patio area. I give these lights two-thumbs up!! Love these blue and white LED icicles. Bought them last year - they remind me of moonlight on real snow and ice. This year we added additional strands. I have not used them yet. They were shipped fast and I plugged them all in to make sure they were all functional. I can't wait to get them on our house next Christmas! After useing standard icicle lights for years I wanted to switch over to LED. I did my research and choose to purchase these. I was very pleased with the variety that they have and the price was pretty competitive. After they shipped I opened the box and plugged them and was completely amazed at the brightness one stand provided. I cant wait to outfit the entire house with LED lights now. I ordered these lights to complement the lighting display I already had. They arrived promptly and packed well. Once I had them in the decorative display, I was very pleased with the look and they held up during our cold and wet season. Thrilled with these lights! I ordered these lights one year ago and loved them. I ordered more this year. This year was easier as they arrived in just a few days! Very nice. I just wish the length of the strand was longer - maybe 200 lights. I bought 12 of these to do the front of our house this year and they look great. Best of all, since they are LED, the whole 12-string run consumes under 60 watts of power. Lovely. I've purchase 6 strings of these LED icicle lights (over the past 6 months). The white and blue color is perfect for my project of converting a large Grey Goose bottle into a novelty lamp. Only negative is the large molded resistors located along the length of the string, but it conceals well (in the bottle).